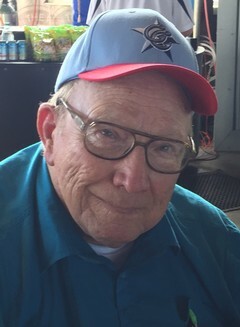 Wayne Chambers (82) passed away on May 31, 2018 in Corpus Christi, TX. Wayne was born on January 11, 1937 in Electra, TX. He was a graduate of Electra High School, Electra, TX. He worked in the oil field supply business for over 40 years mostly with Gulf Supply, Co. in Corpus Christi and Houston and eventually retiring as a Store Manager for IPS, Inc. in Corpus Christi. He enjoyed travelling and made trips to Alaska, Japan, Germany, Austria, Korea, France, Italy, Kenya and Saipan as well as visiting nearly every state in the lower 48 in his 5th wheel trailer with his wife. Wayne was a baseball fan and held season tickets with the Corpus Christi Hooks minor league baseball team since their opening game in 2005. He was especially happy to see the Astros win the World Series in 2017. He was preceded in death by his wife of 60 years Kathy, parents Roy and Ruth Chambers, sister Margaret Pool, and brother Roy Chambers, Jr. He is survived by his sister Mary Elizabeth Cafarella of Malden, MA, brother Richard Kenneth Chambers of Grande Praire, TX, sister Joy Hallmark of Vernon, TX, daughter Tanya of Sasebo, Japan, son Derek (Maria), grandsons Cole and Casey of Saipan, Northern Mariana Islands, and special friends John and Yolanda Anderson of Freer, TX. The family wishes to express gratitude to Dr. James Mobley for his years of personal attention. ​Visitation will be held from 1:00 PM - 5:00 PM on June 12, 2018 at LImbaugh Funeral Home. In lieu of flowers or other gifts, memorial donations may be made to the charity of your choice.